Around the earth on GIS Day—November 14, 2012—and adjacent days, more than 950 organizations hosted events for thousands of participants, who celebrated GIS and the ability of the technology to make the world a better place. Though separated by thousands of miles, the following three GIS Day festivities had a common cause: to change the world, one event at a time. Esri Rwanda Ltd. celebrated GIS Day with presenters from numerous government organizations at Telecom House in Kigali, Rwanda's capital city. The main objective was to share and discuss GIS work experiences with 70 guests—most already familiar with GIS—from various Rwandan institutions, nongovernmental organizations, universities, and colleges. GIS Day in Rwanda, east Africa. The event in Kigali was organized by Carnegie Mellon University in collaboration with kLab, which provides an opportunity at Telecom House for IT entrepreneurs and developers to collaborate and pursue their interests. Esri Rwanda opened the event with a status report on what's new for the tech-savvy east Africa nation regarding ArcGIS Online, ArcGIS 10.1, and various public services that employ GIS. Later, GIS professionals from 13 institutions discussed how they teach GIS and remote sensing in civil engineering and related programs. Presentations by public agencies showed that GIS is used in a broad range of projects and services, including construction permitting; energy, water, and sanitation planning; rural settlement planning; urban planning and management; and land registration. Attendees found that GIS Day showed a broad picture of the technology in Rwanda. One important outcome was an agreement between participants to meet four times a year to share experiences, challenges, solutions, and successes and to discuss strategies to make accessing geodata easier. The Florence County GIS Department and Tax Assessor's Office celebrated Geography Awareness Week and GIS Day on November 13 and 14 at Wilson High School in Florence, South Carolina. Organizers also sponsored a GIS Day drop-in on November 15 at Florence County Library. More than 200 eager students participated in two action-packed days of interactive presentations. Presenters used detailed GIS maps to depict how GIS relates to daily activities. The students learned how data that's collected simply by using their cell phones can be processed to visually show location-based information—that GIS is everywhere. To support the event, Wilson's geography and social studies teachers rearranged the class curricula to lead up to planned GIS Day activities. Parents were encouraged to attend an evening open house, which also celebrated American Education Week that same week. Students eagerly told their parents what they had learned in the classroom about GIS. The open house also was an excellent opportunity for parents to ask questions about geospatial technology. The GIS Day drop-in was open to the public, attracting local residents and others interested in learning more about services, products, data, and GIS solutions in the county. Also invited were all county and city departments, along with elected and appointed officials. The drop-in included demonstrations of web, mobile, and GPS data collection. Land record boundary adjustments were demonstrated with ArcGIS, and visitors also reviewed county council districts and other information on ArcGIS Online web maps. The demonstrations were well received. Attendees said they were now ready to use their computer and mobile devices to access web and mobile solutions. A map gallery displayed award-winning posters, along with digital photography equipment. Pictometry Online made a popular debut, demonstrating the value of oblique (angled) aerial imagery. Numerous visitors from other county departments took time to view the displays, which added to the overall success of the day. 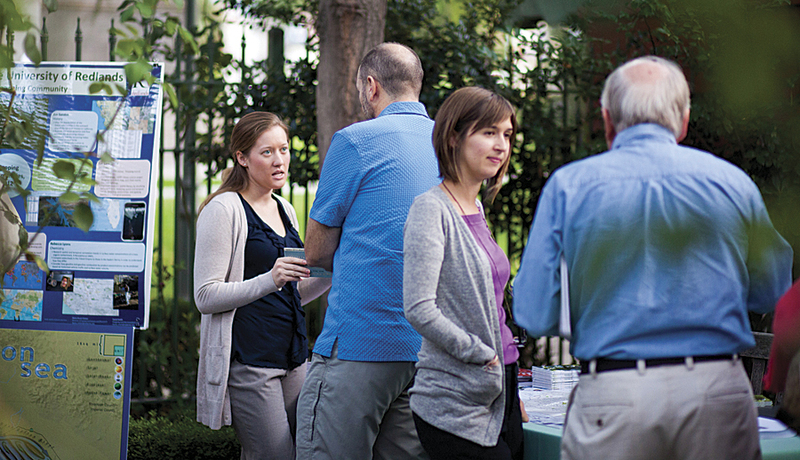 Esri hosted its first GIS Day celebration in Redlands, California. 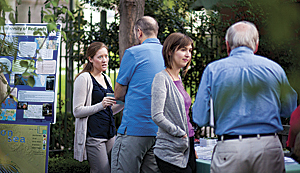 Esri hosted its first GIS Day celebration in Redlands on November 14 in a three-hour event at the downtown A. K. Smiley Library. Local residents—including students, teens, seniors, and young children—came to see how GIS works and is employed to improve the community. Presenting organizations included the City of Redlands, Colton-Redlands-Yucaipa Regional Occupational Program (ROP), the Inland Valley Newspaper Group, the University of Redlands, and Esri. A geography story time for young children was hosted in the children's library. Examples of how GIS is used and who GIS professionals are—from White House advisers, city planners, conservationists, and scientists to public works employees, search and rescue specialists, county assessors, and teachers—were presented, giving the audience a better understanding of the broad application of GIS. Tom Resh, from the City of Redlands, discussed the many ways the city has incorporated GIS into its services and demonstrated how local residents can access and use various municipal map services. "So far, I've learned that mapping is used in every single part of our lives—everywhere, for everyone," said Kim Scolieri of Redlands, explaining how GIS fits into society. "I can't think of anything it wouldn't apply to." Irvine resident Roxanne Brooks came to the event after attending her daughter Amber's public presentation of her master of science in GIS project at the University of Redlands several hours earlier. "I'm here this evening so I can keep up with her," Brooks said, laughing. "I find it very interesting. . . . It's a wave, definitely an important part of the future here. And Amber is always talking about it. GIS may be widespread, but I'm not that familiar with it." Yui Shin, a teacher at the Colton-Redlands-Yucaipa ROP, introduced three Redlands High School students from his computer repair class. "We originally started [the class] by teaching students how to become certified repair technicians," said Shin. "Then we found that when circuit boards were dying and burning out, . . . mapping could actually be used even on circuit boards." David Smith, a computer and mapping support specialist with the University of Redlands, said the university teaches students to think spatially in three ways: in space via navigating, wayfinding, and even sports and dance; about space by thinking about the physical world, such as modeling ocean currents; and with space, or using space to look at patterns or making concept maps. Gina Dvorak, multimedia editor for the Inland Valley Newspaper Group, gave a glimpse into how a newspaper employs GIS to augment news coverage. "We learned a long time ago that location matters to our readers," Dvorak said.